The Prairie Conservation and Endangered Species Conference will be held in Saskatoon, Saskatchewan, February 16, 17 & 18, 2016. Organizers are encouraging presentations and posters from people interested in the integration of prairie conservation and urban development. As our rapidly growing prairie cities encroach on prairie uplands and wetlands, urban planners and conservation organizations seek solutions that preserve biodiversity and enhance quality of life while meeting the demands for infrastructure, transportation, and commercial and residential development. You’re invited to share your experiences, ideas, and questions at this conference. If there is sufficient interest, the conference organizers will arrange dedicated concurrent sessions around this topic in the conference sub-themes. Additional information and guidelines for presentations and posters are available online. The deadline for submission of abstracts is September 4 (end of day). Sept. 13/15 Update: The deadline for submission of abstracts has been extended to October 2 (end of day). 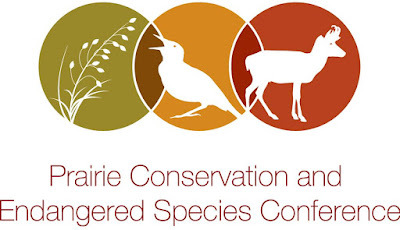 The Prairie Conservation and Endangered Species Conference is held once every three years and is attended by approximately 350 participants from across Western Canada and the Northern Plains states. It attracts a diverse audience, including producers, policymakers and planners at all levels of government, conservation and other non-governmental organizations, researchers and graduate students from a wide array of disciplines. You can follow the conference on both Facebook and Twitter.